For more than 25 years, The Medallion Award has recognized competence and character in the lives of SPU Alumni. Seattle Pacific University alumni live diverse lives. And twice a year — at Homecoming in February and the 50-Year Class Reunion in June — SPU presents Medallion Awards to some of the alumni who have served the University and the community with particular distinction. Nominated by fellow alumni, recipients of the Medallion Award are loyal supporters of Seattle Pacific and true to its ideals, standouts in their chosen professions, contributors to the welfare of the community and active participants in their churches. This year, Medallion Awards were presented at Homecoming to Bruce Palmer ’79, Karen “Billie” Tadema Palmer ’81 and Nancy Murphy ’90, individuals who are making a significant difference in the healing and support of families. More alumni will be honored in June. 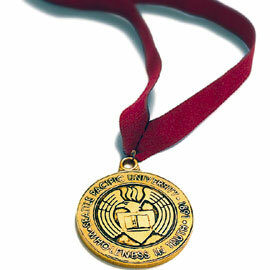 Call the Alumni Center at 206/281-ALUM to nominate someone for a Medallion Award. were honored as part of SPU’s Centennial celebration. 2002 | Donald Bilderback ’69, Gerald Klein ’60, James Leierer ’52, V.O.